When one is travelling the world there is a plethora of activities and aims that usually fill the mind of the excited adventurer who is setting sail into unknown waters for the first time. That long list of attractions, monuments, museums, sights, parks and other popular hot spots no doubt includes some local pubs. If one asks “why?” to this final item on the must see/do list, then clearly they aren’t a fervent lover of the fine beverage known the world over as beer; an ancient beverage produced from the fermentation of starches which are derived from cereal grains and flavoured with hops. Trying new local beers fresh out of the tap is like cold heaven, dripping and frothing down the side of a chilled pint glass and waiting to be consumed, exciting the mouth and mind alike. This lovely image is one of the most exciting things that can occur when travelling to new lands; especially after a day of sightseeing or exploration. After an afternoon of inspiration due to new surroundings, nothing tops some good food, conversation and quality beers unique to the region while under the sun or stars and relaxing on a patio. If the weather isn’t of the welcoming and accommodating type, then by a fireplace in a pub surrounded by fine decor is often a memorable setting. Nearly every country has a unique beer that defines it; although this stereotype is often much to the chagrin of her citizens. The Australian beer lover cringes every time they are associated with Foster’s for the most part, much like an American beer lover is baffled into disbelief after being attached to Coors Light or Budweiser as their beer of choice. The list goes on and on, seemingly into oblivion’s darkest alcoves. Molson Canadian in Canada, Beck’s in Germany and Heineken in the Netherlands are all beers that fall into this judgemental category as well. The truth to the matter is however, while these beers are drinkable and enjoyable, the true bounty is usually found in the beers that microbreweries found inside each particular country offer. Microbreweries provide passionate brewing made by beer drinkers who love what they do and must love what they drink. In Australia, Cooper’s has been making wonderful crafted beers for over a century that often fall into the mainstream due to their immense quality and taste, but don’t be misled, this is still one beer not to miss. A selection of Sparkling Ale, Pale Ale, Extra Stout, Lager, Mild and Light are the main drops in the Cooper’s repetoire, but a special blend is also available with a high alcohol content of 7.5% and a rich, chocolatey palate. The Sparkling Ale’s cloudy mist of sediment left behind, floating suspended in the delicious liquid and a high alcohol rating of 5.8% makes for a surprisingly refreshing drink and is definitely a high point in the catalogue. The Pale Ale which is the most popular drop of the beers is alot like the Sparkling Ale minus the rich flavours and extra zing. Across the pond in New Zealand, Monteith’s is responsible for a lovely catalogue of beers, with seasonal ales and specialty beers that suit the different times of the year. The Summer Ale, a herb and honey tinged brew of citrus and cinnamon is as refreshing as a lemonade on a warm Summer’s day, while the Winter Ale is a doppelbock styled beer with a lovely thick consistency that truly lives up to the term “Liquid Bread” which Benedictine Monks christened the Bock centuries ago. The Original Ale, a standard brew and the most well rounded in the catalogue, along with the self explanatory; Pilsner, Dark Ale, Red Ale and Lager round out this stunning selection. Every country has a myriad of breweries to discover and this continues as we travel further across the great divide that is the Pacific Ocean, arriving in North America. In Western Canada, Big Rock makes high quality beers that know no boundaries in creativity and quality. The Steam Whistle brewery makes fine beer of a micro style available to the masses in Eastern Canada, and in Portland, Oregon the Alameda Brewing Company makes a memorable drink that must be tried. To list all the possible beers provided by the hard working folk at microbreweries the world over would be impossible in one article. Hopefully this small but credible listing provides a jump start to the traveller going through Australia, New Zealand or North America seeking that next beer fix. In the next article, we’ll look at beers of tradition and quality in Europe. Cheers, and enjoy that next pint. Apple orchards are fun and exciting places for children to visit. They enjoy having the opportunity to pick apples off of the trees. At the end of the day, they feel like they accomplished something great when they get to bring their apples home with them. Preparing children to visit an apple orchard is a great idea so they know where they are going and what they will be doing there, especially if they have never been to an apple orchard before. 1. Talk to them and let them ask as many questions as they have. 2. Look up information on apples and orchards together on the internet, additionally see if you can find videos of people picking apples and watch the video(s) together. If you can’t find videos, look for pictures of what happens in an apple orchard. 3. Show them the website, brochure, or any other information there might be about the orchard they will be visiting. Some orchards offer a wide variety of activities for children including wagon or hay rides, games, educational activities, corn mazes, demonstrations, places to sample or purchase desserts and other dishes made with apples, etc. Kids are likely to get real excited about their upcoming orchard visit if they see all of the fun that is awaiting them. 4. 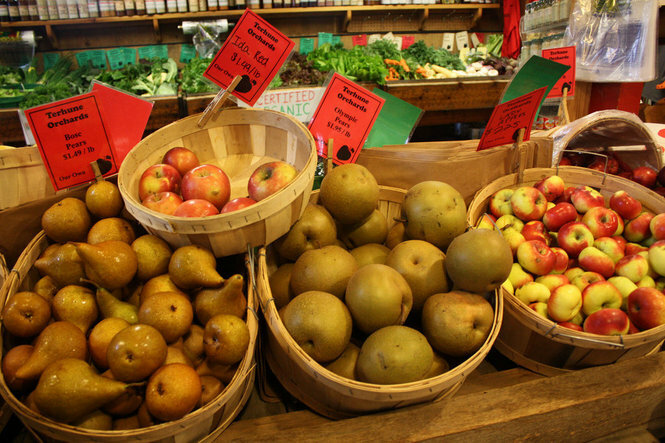 Take them to the grocery store to show them all of the different varieties of apples that there are. Show them and tell them the names of each unless they are able to read the signs themselves, then have them read them. 5. Pick out clothes to wear to the orchard, probably long pants such as jeans and a long sleeve shirt, socks, and closed toe shoes. This way they are likely to not get hurt or scratched. Being in an outdoor area with trees, injuries can and do happen, however dressing properly for the occasion can really help. It’s also a good idea to bring a coat or sweatshirt along as well in case it is needed, which can be the case in the fall. On the day of the orchard visit, it’s very likely that the child or children will be really excited and ready to pick apples. Make sure the kids are dressed in orchard-appropriate gear, grab some bottled water and snacks, sunscreen, bug spray, and a small portable first aid kit, and head out the door. Apple orchard adventures are great for kids. They are both educational and fun and can develop into a special family tradition that happens every year. Children learn where apples come from and take pride in picking their own to eat or use in making tasty apple treats at home. 3. Pine Tree Apple Orchard. Minnesota grown apples and strawberries.